Registration for the upcoming #iTeach808 2016 Conference is now full! Mahalo for sharing! Registration is now open for iTeach808: Empowering Hawaii’s Teachers In Technology. This FREE educational technology conference will be held on Saturday, September 10. It is open to all educators in Hawaii. Register today at http://iteach808.blogspot.com/ . Space is limited. International speaker Alan November is returning for a 90 minute keynote on preparing 21st century learners. There will also be 10 different 1 hour workshops to choose from such as MinecraftEDU, Google Classroom, and BreakoutEDU. Coffee, breakfast, and lunch are included. First 100 at the door receive a free t-shirt or copy of Alan November’s book. 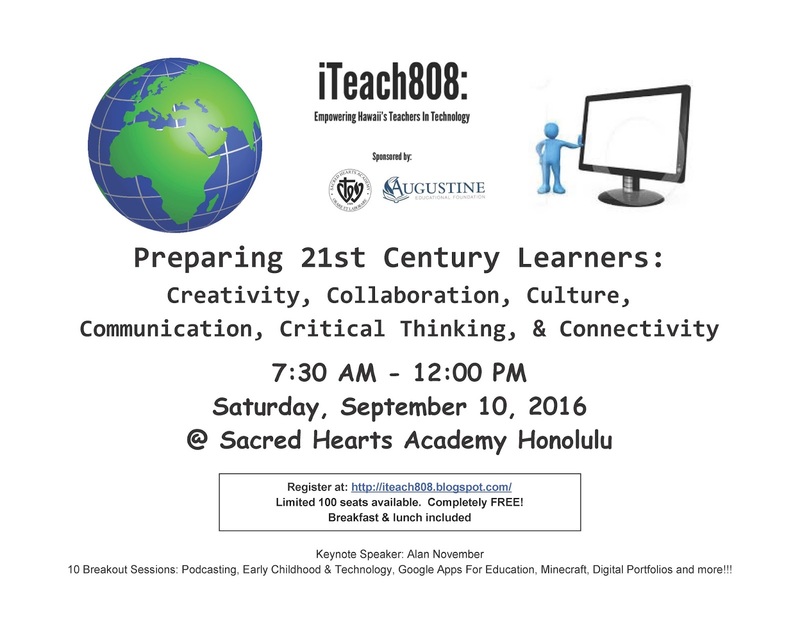 iTeach808 is sponsored by the AugustineEducational Foundation and Sacred Hearts Academy.